Durbanville property Bloemendal is one of the ventures that Shimmy Luxury Collection has a stake in, the luxury hospitality group, which is headed up by entrepreneur Nicky van der Walt, also involved in the running of Shimmy Beach Club and Sea Point hotel The Ritz. 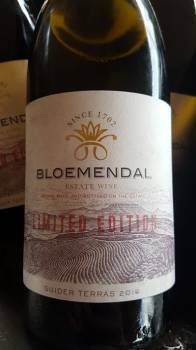 Management appear keen to take Bloemendal to the next level, with the 2015 vintage of the renowned Suider Terras Sauvignon Blanc set to sell at R475 a bottle. Does it deserve its price tag? Lombard Loubser is viticulturist and Francois Haasbroek of Blackwater Wines consults as winemaker, the two having previously worked together at Waterford in Stellenbosch, and they clearly want to make a statement with this wine. Grapes come from a 8ha block planted in 1982 which in the case of the 2015 vintage yielded an average of less than one t/ha, 943kg to be precise. The wine is fermented and matured for between 10 and 14 months in 500-litre barrels, 30 to 40% new. Total production is 2 658 bottles, 900 bottles of that available in specially branded, six-bottle cases packed in sequential order. The nose shows blackcurrant, peach, green apple, fynbos and fresh herbs. The palate meanwhile is characterized by an exceptionally good core of fruit and lively acidity before a piquant finish. The wine moves very well in the mouth, being intensely flavoured but not too thick textured. This will reward cellaring – the 2013 which was available for tasting at the launch has really come on by virtue of time in bottle and the 2015 looks set to go a long, long time. For a gallery of images from the launch function, click here.